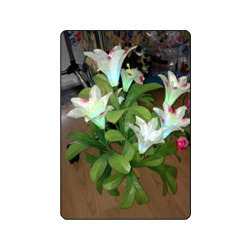 Being the leading names in the industry, we offer our clients attractively designed range of Artificial Plants that are used to enhance the look of the surroundings and are available at most affordable rates. Our entire product range is manufactured using quality approved material from our associate’s thereby delivering flawless range of products to our discerning clients. Lulu's Import & Export is a sole proprietorship company, started its business as Importer, Exporter, Supplier, Wholesaler & Retailer in the year 2002 in Bangalore, Karnataka, India. The company is engaged in offering a comprehensive range of Gift Articles, Toys, Garments, Footwear, School Bags, Household Items, Electronics Items etc. We also offer Building Construction Material like Marbles, Stone Tiles, Sanitary Items, Porcelain Tiles, Plywood, Chip Boards, Stainless Steel Sheets, UPVC Windows & Doors, Wall Papers, Furniture, All Lighting Products,Electronic Products, Hospital medical and dental equipments & CNC milling machine, CNC lathe machine. (We provide all the above product on the basis of buyer's requirement). All our range is sourced from the trustworthy vendors of industry, holding sharp insight and intelligence of respective domain. While sourcing these products from vendors, our experts stringently check their excellence on various parameters to ensure their flawlessness, quality, reliability and others. For this, we have adopted and following the industrial suggested quality control guidelines and policies, which helps us in maintaining continuous flow of qualitative range in the market. Clients are appreciating our products for their unmatched features such as beautiful designs, smooth texture, easy maintenance, attractive colors and patterns, accurate composition and many others. As a result, our products are demanded by the clients spread in the market of South East Asia, Middle East, East Asia and Indian Subcontinent.